About 12,000 armoured vehicles 1921-2016. العراق (al-ʿIrāq) was known already since the 6th century. Long before that, the country saw not only one of the first and earliest civilizations (Sumer) and the first standing armies. Babylon and its empire also enlightened the bronze age and left us a legendary metropolis. None also contest the military abilities of the Assyrians, which originated from northern Iraq and which invented siege warfare among other things, ruthlessly creating one of the greatest empire of the Bronze age. This region began a new existence as a Persian Satrapy under the arrival of Alexander the Great (330 bc). Afterwards, it was a Seleucid Empire province before being subdued by the Parthians. The Romans succeed only to hold a part of a province, and Christianity made a durable foothold in the north. The Sassanians invaded Iraq. After the split of the Empire, the country’s western borders became the eastern frontiers of the Byzantine Empire. The Neo Assyrian states became gradually a more unified province known as “Al-Iraq”. In the 7th century AD, the Arab expansion saw Iraq being a part of the Rashidun Caliphate (capital Kufa). It became later the Umayyad Caliphate (governed from Damascus), and eventually the Abbasid Caliphate, which built Baghdad. This city became in the 8th and 9th century arguably the centre of culture and power in the whole Islamic world. From there, the Abbasid empire ruled an empire stretching from the Indian borders to Spain. It fell to the Mongols in the 13th century, Tamerlane in the 14th century, and eventually became a part of the Ottoman Empire until the end of WW1. Iraqi soldiers were found in the Ottoman Army at large and fought the British in the Mesopotamian campaign (the British lost 92,000). Eventually, the latter controlled the entire territory by 1918, fielding 410,000 infantrymen and cavalry supported by tanks. By the virtue of treaties, the region known as the “State of Iraq” passed under British protectorate under the rule of a Hashemite king, Faisal I of Iraq and Sunni Arab elites were chosen as key members of the government. After a rebellion and T.E. Lawrence influence back in Britain, a new commissioner was named and until the early 1930s prepared the transition to a fully independent state. As an independent country in 1932, Iraq was ruled by King Faisal, then King Ghazi in a troubled political scene marked by coups d’état attempts until 1939. In 1941, at last Rashid Ali al-Gaylani and members of the Golden Square made a successful coup d’état but his new government (which had marked sympathies for the Axis) had to face hostility from the UK which feared a seizure of the rich oil supplies in the region, vital to the war effort. Together with loyal Assyrian levies, the British Army defeated the poorly equipped Iraqi and secured a military occupation followed by the restoration of the Hashemite dynasty. Although British presence nearby some strategic assets was maintained until 1954, Iraq became independent one again in 1947. A new, more modern army was created, supplied by British ww2-era vehicles. However, the execrated ruling dynasty was expelled by a new coup d’état by in the 14 July 1958 Revolution which created a military dictatorship. Himself was expelled by Colonel Abdul Salam Arif (February 1963), and eventually by the Ba’ath Party in 1968 which created a republic. Ahmed Hassan al-Bakr was the first Iraqi president, but Saddam Hussein, an officer, was remarked and quickly made its way into the military, and political spheres as key Councillor. He became president and controlled the Revolutionary Command Council (RCC) in July 1979 when the Iranian revolution erupted. He initially welcomed the overthrow of the Shah and sought to establish durable relationships with the new regime. However, as the latter called to spread the Islamic Revolution to Iraq (Chi’ite Islam) whereas the Iraqi were Sunnis in majority these relations were rapidly poisoned. In addition, Kurdish rebels were armed and supplied by Iran to Saddam’s dismay which had to commit the army in 1980 in Northern Iraq. At that time, Iraq was well armed by Soviet-built vehicles, MBTs, APCs, IFVs and the army was trained by foreign (Soviet) instructors. Nevertheless, in the following war, the US government gradually came to help the regime against Iran, as France later. Saddam declared war on Iran in September 1980 in what is called now the First Persian Gulf War. This “Iraqi Vietnam” saw no clear gains but was a brutal stalemate (after initial successes until 1982), when the Iraqi Army had to withdrew and fought mostly a defensive border until 1989. The situation as of September 2015 (Wikipedia). Here a T-72M. T-72Ms (the basic export version) formed the bulk of the Iraqi Army first line divisions in 1991. The first was acquired in the 1980s and about 60 were lost in the Iran-Iraq war, which gave the impetus for modifying and “improving” existing stocks (see below). 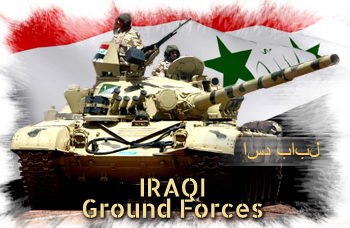 Iraqi T-72s confronted Chieftains and M48/M60A1s with good results against Chieftains. They performed quite well also in the battle for Basra, their frontal armour proving immune to TOW and RPGs, or standard 105 mm shells of Iranian M60s. The Asad Babil was assembled in Iraq from part of T-72M (the export version) but was apparently downgraded in the process. Despite the official propaganda, the “Lion of Babylon” did perform poorly. Production numbers are evasive and it was apparently linked to the Saddam, built earlier. This modified version of the T-55 was proper to the Iraqi Army in many ways. “Enigma” was coined by the coalition forces were encountering some. These were command tanks, heavily modified with many add-on armour plates inspired by the T-55AM, protecting the turret front, turret sides (spaced armour) and turret rear shaped into armoured boxes. The turret rear plates acted as a counterweight as it added 4.5 tons more in weight to the turret. It also had improved NBC, FCS and vision devices. Here an Iraqi T-55 in the time of the 1991 war. The Iraqi army obtained 725 from several sources starting in 1973, many were still in service in service in 1991. The Republican Guards were given T-55MVs (last batch of 150). Other were locally modified as the QM (extra appliqué armour) and QM2 (125 mm smoothbore gun). Before that, Iraqi purchased 250 T-54s in 1958, and 50 more in 1965, but most were lost during the Yom Kippur war. Iraqi T-62, 1st gulf war. 700 were delivered by the Soviet Union between 1974 and 1979, nearly 200 were lost in the Iran-Iraq war. Apparently, about 1,500 were in active service on the eve of the invasion of Kuwait. Chinese-built export tanks acquired in the 1980s. Here a QM2 (above) supposedly armed with a 125 mm smoothbore cannon, new FCS, and below a conventional Type 69-II QM. The latter had a local appliqué armour, and some were equipped with a 60 mm mortar. There was also a Type 69 QM-Enigma command variant. Apparently, some 1,500 Type 59/69s of all types were in service in 1991. These “cheap T-54s” as they were considered in NATO circles were also purchased by the hundreds to beef-up the Iraqi armoured forces during and after the Iran-Iraq war. Here a Type-59-II. Together with the T-69 around 1,500 Chinese MBTs were in service in 1991. This IFV (here from the new Iraqi Army) was available by the thousands in 1990. Still kept in reserve were thousands of ww2-era tanks acquired in the 1960s, among these T-34/85M like this one, still active in the 1980s and the Iran-Iraq war as well as ISU-152s. Others included second-hand or even third-hand M4 and M4/105 Shermans, possibly former captured M51 Shermans (ex-Israeli), M36 tanks destroyers, but also a few captured ex-Iranian Chieftains, M47, M48, and M60 Pattons, FV101 Scorpions.